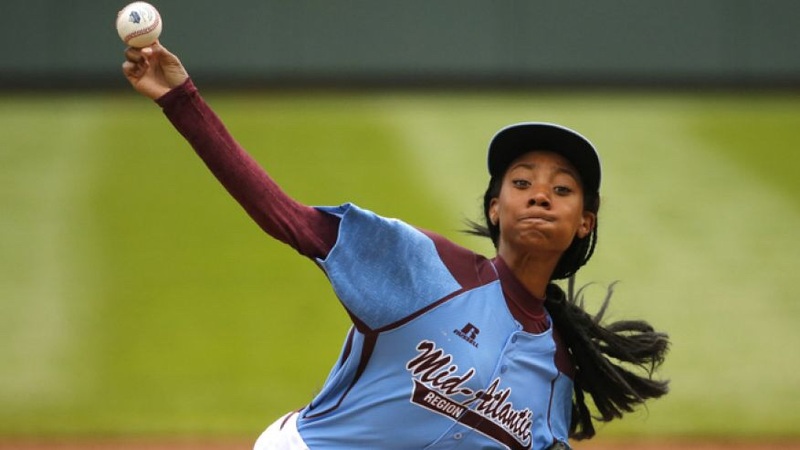 Sport: Mo'ne Davis Teaches "How to Throw Strikes"
It's refreshing to be around kids. They divulge deep truth without realizing that their words can pierce through fear and unlocked courage. Rarely, do I have the chance to interact with a world super star athlete. On the heels of her dazzling performance at the Little League World Series, Miss Mo'ne Davis and I both attended the espnW summit in Dana Point California this fall. Right before a crucial meeting at the espnW summit, Mo'ne was asked to give me advice by our good friend and mentor Sue Enquist. "Coach" huddled us in, eyes locked and our bodies in a "ready position". It was the dugout moment before I took the mound. Enqusit, "Mo'ne, Jenné is stepping into her Little League World Championship. She needs to throw a strike, not for her story but for every athlete story. This is the big time, this may change history"
Davis, closed her eyes softly, and opened them with the assurance of a seasoned Olympian. Her voice was still but strong. "Stay calm, and just be you"
With that small statement. I heard my fathers voice. Before any large match or meeting I have ever had to conquer, the words - just be you - have stayed with me as I forged onward. The universe stopped in that moment. How did a 13 year old do such a thing? My eyes filled as I let the exact words I needed sink in. With those carefully spoken words, I didn't feel alone... I felt strong! I knew I was meant to "pitch" this idea. And I was ready to throw strike after strike (fact after fact). Walking away, I knew I would always remember her poise and understated strength. It was my favorite watershed moment of the summit. That day, she was a mouthpiece of encouragement and direction for my story. In the heat of the moment, she delivered a strike to my heart, to spur me on in my mission to make a difference. Dont know who Mo'ne is? Check out her Chevy commercial that was showcased during The World Series. If you have some more time, check out the extended 16 minute version of her story, directed by Spike Lee. One thing rings true in this story. Not only has Mo'ne inspired America with how she "throws like a girl" at 70mph, but she has the intelligence to read situations and throw metaphorical strikes with words. Talk about a powerful young woman.